I was one of several authors to contribute to the book. Conservative news and commentary on today’s issues, seen through the lens of applied liberty. 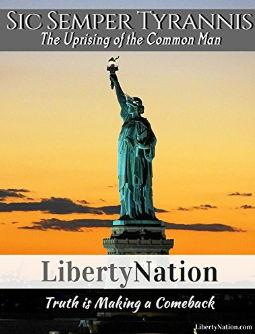 Liberty Nation authors don’t just report the news, they explain why it matters to you. Engaging and thought-provoking, this collection of articles navigates the reader through the many and varied aspects of tyranny in America today. Ultimately, Sic Semper Tyrannis reveals why true power in a Republic is and always should be – in the hands of the people. Tyrannical governments, corporate corruption, globalist elites. These are the words that engulf modern America and create an aura of fear and victimhood. A relentless legacy of betrayal and tyranny define the roots of political parties that are controlled by money-men who use the democratic process as a tool with which to wield and exercise power that should rightly be in the hands of the people. Liberty Nation presents a unique series of articles from a range of writers, journalists, and analysts that examine not just the tyrannical elements of the past, but those that are hidden behind the veil of respectability in the modern age. Sic semper tyrannis is a collection of writings that examine globalism, American politics, the tyranny of the far left, and how even today, when we are held up as the bastion of freedom and liberty, we are being slowly enslaved by a divisive and wanton agenda.